Are you ready for an epic adventure, eager to push the edge of your limits and expand your possibilities in a fun and memorable experience? Then, the ultimate adrenaline adventure of canyoning in Raghaz Canyon is going to fulfill, and even exceed, all your expectations! The most popular canyon in Iran, Raghaz has it all at the same time. Jumps, slides, abseils and whatever you can wish for. Raghaz is a MUST DO canyon in Iran, with its crystal clear turquoise pools. Trekking in a dry landscape, all of sudden you hear the sound of running water and that’s where the adventure begins! A great place to start your canyoning adventure. From Darab, you’ll join us for an exciting 4 wheel drive ride, then you’ll get to where you need to drop off the car, put on your back pack and start the almost 2 hour walk up to the heart of Zagros Range, where the canyon begins. During the hike, you may see no sign of green plants and running water, wondering “Is there really a gorge hiding there?” and the answer is “YES”! Just when you are starting to wonder, you can hear the sound of the spring from which all the water flow of Raghaz originates. That’s where you’ll jump into your wetsuit, put on your harness and pop your helmet on. After a safety briefing by your guides, you’ll enter into one of the most stunning places of Iran. You’ll be jumping, swimming, sliding and abseiling through this gorge for about 4 hours. 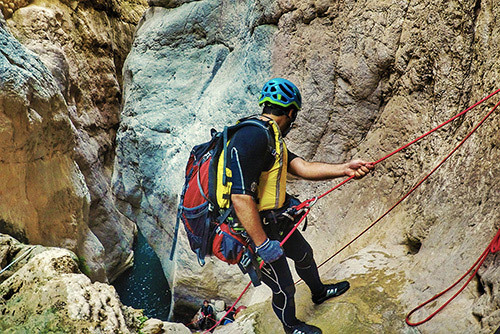 This breathtaking adventure ends up with a 30 meter abseil and then the “Good-bye Pool”, and then a short walk to the parking, where your vehicle awaits to take you back to Darab.